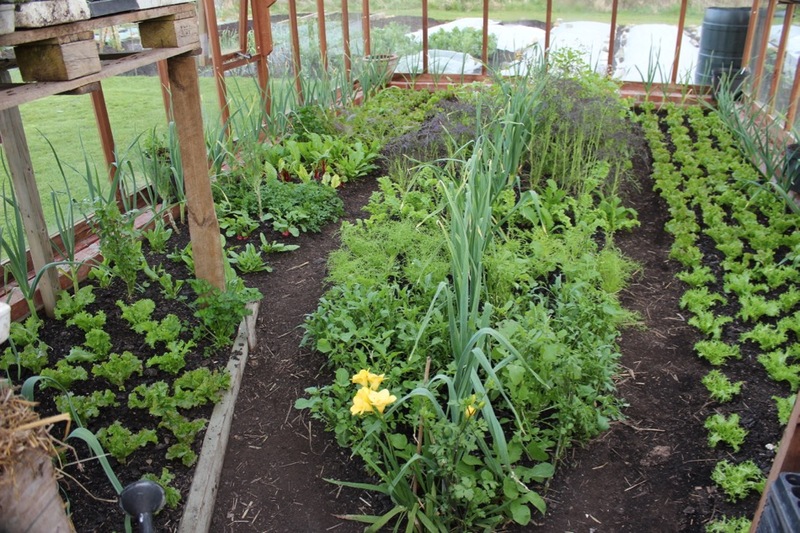 I have been loving the strong growth of overwintered plants such as broad beans, garlic, salad, cabbage, broccoli and kale. 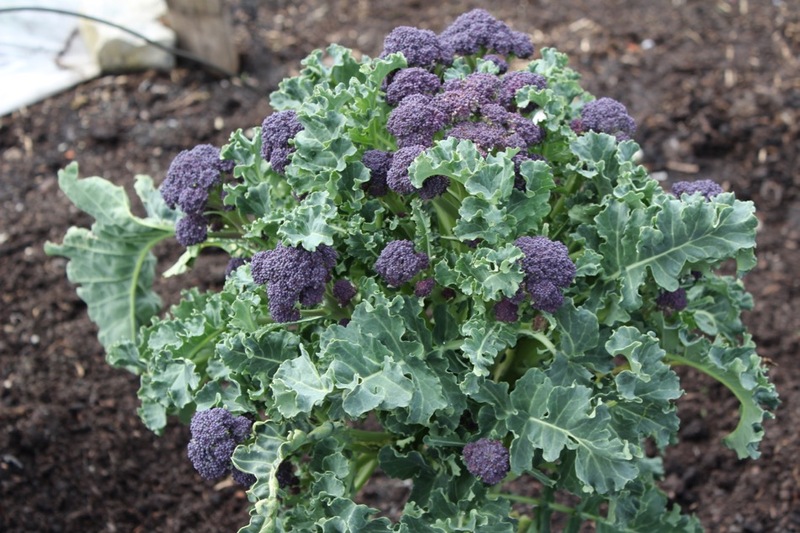 New plantings are appreciating any warm days but are still slowed by cool nights and there are more frosts to come. New warmth and longer days are helping weeds as much as our plantings. 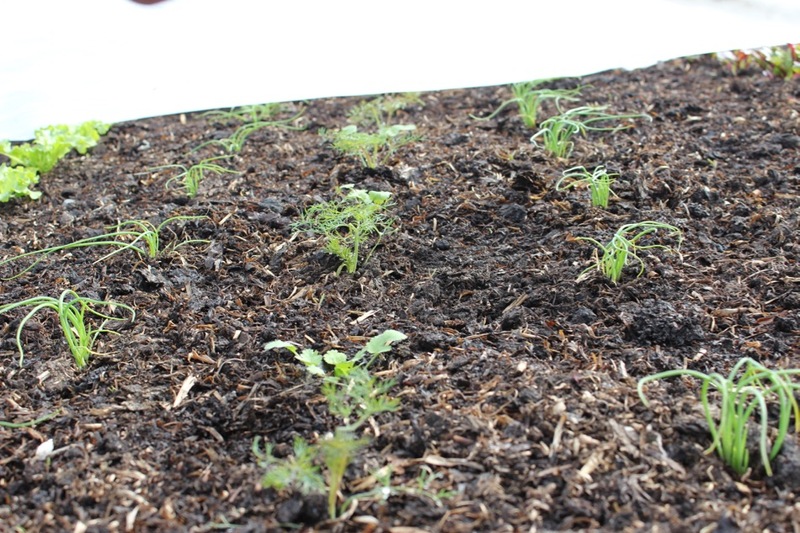 This is a key time for staying clear of new annual weeds, by lightly running a hoe through the surface soil or compost when weed seedlings are barely visible. 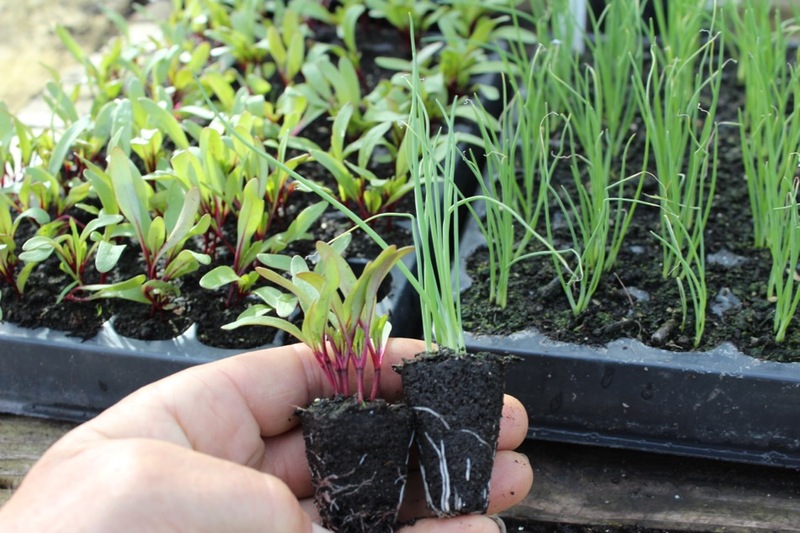 Once weeds have grown their first true leaves, their root system is developed to the point where regrowth is possible after hoeing, so larger weeds, and grasses too, are worth hand weeding – which is rapid when they are small. 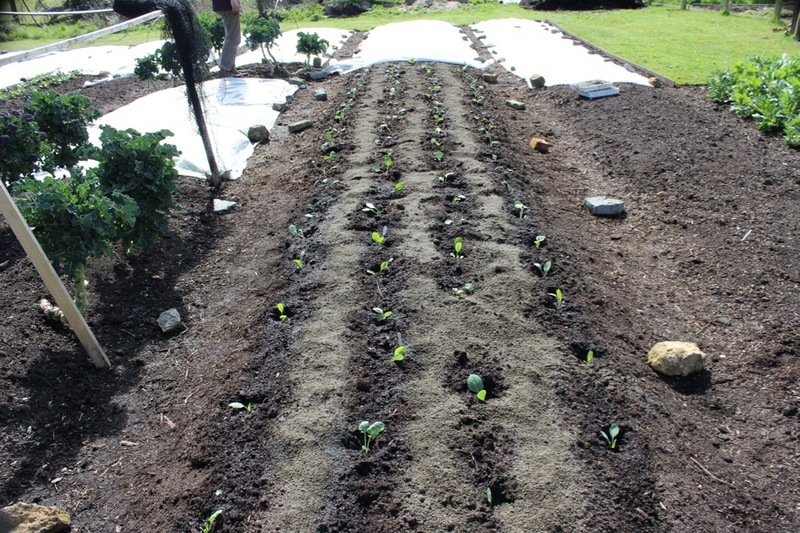 Mid April is a great time to sow the first courgettes, and many other cucurbits such as melons, cucumbers (only for undercover cropping, sow cucumbers for outdoor growing in late May) and squashes. 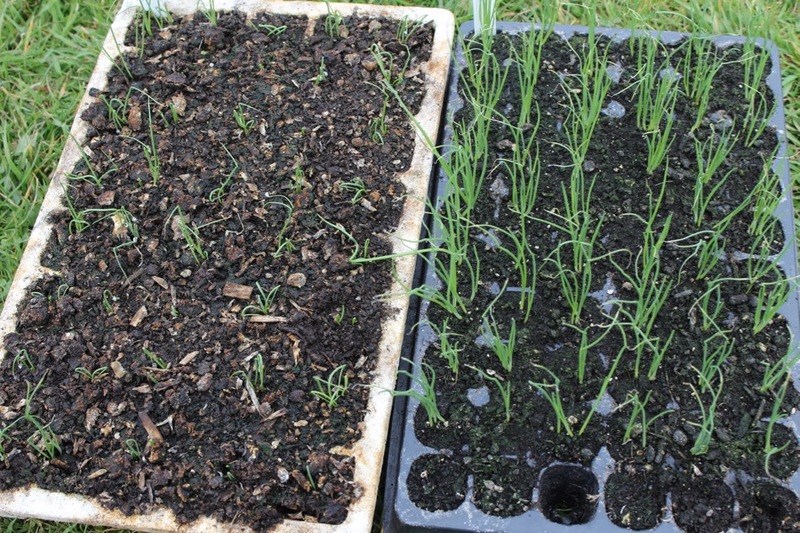 Should one sow the seeds flat or pointy-end-down? The Michauds of Sea Spring Seeds compared growth from both methods and found no difference; I mention this in my Myths book. 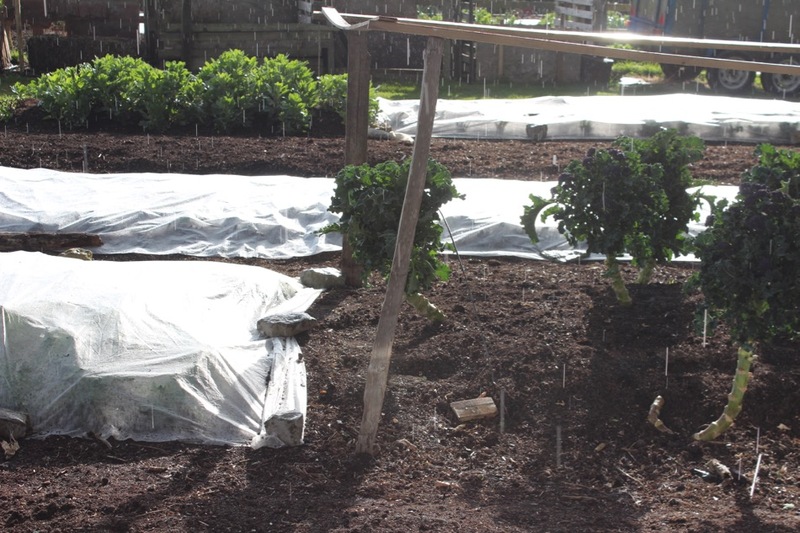 Also good to sow now are basil, leeks, chard, leaf beet, Brussels sprouts and any of the earlier sowings you have not made yet. 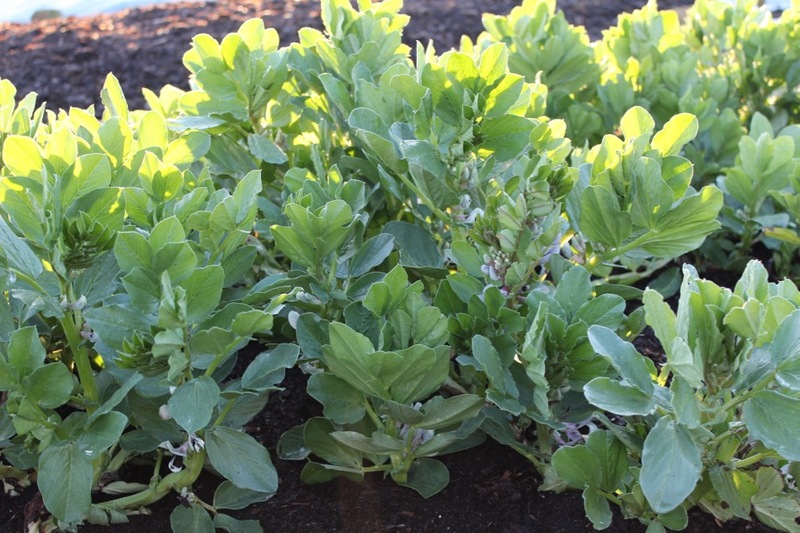 Don’t delay if you are still to sow pea and broad bean which do better from earlier sowings, as they are “programmed” to make the healthiest leaves in spring, then to flower in early summer. Later sowing attract more pest and disease. The temperature at one foot in has been a steady 50-55C and module compost on the wooden frame above is 9C on a cold night (when 2C in the greenhouse) and 12C on a milder night, then around 24C by day. 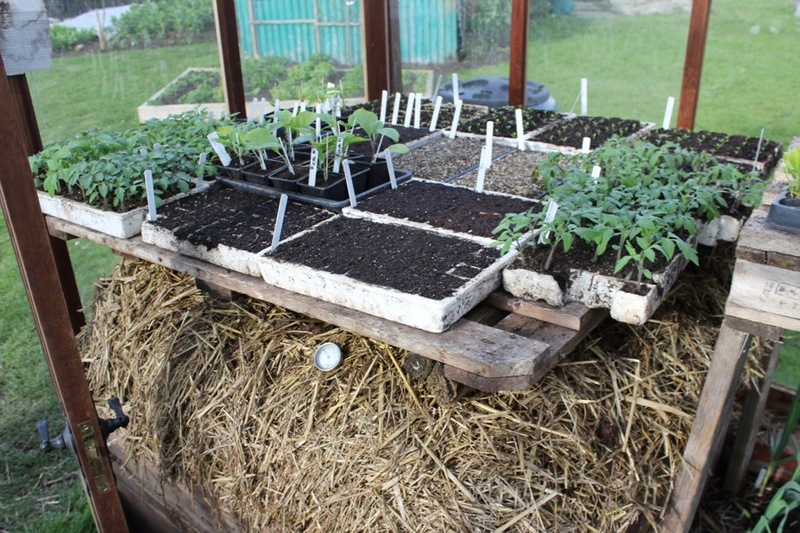 Tomatoes look happy, partly from sending roots into the moist surface. On 13th April we took everything off and piled two more barrows of day-old horse manure on top. The hotbed temp dropped to 30C before recovering. Now there are aubergine and pepper plants, with basil, cucumber and melon germinating, also the first courgettes. 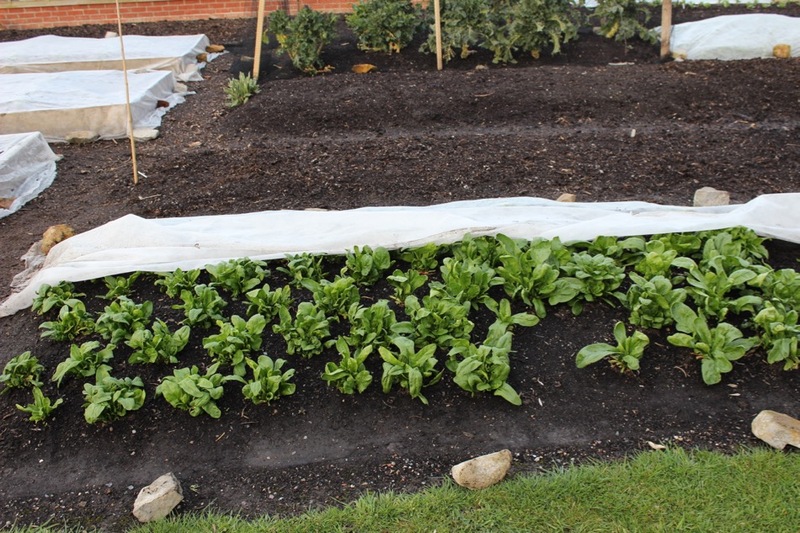 Homeacres looks white at present with more than half the beds recently planted and covered by fleece, which has made all the difference during days of cold winds and nights of frost. It does not keep all frost out, and there is crisping of leaves that touch frozen fleece, but it holds warmth at surface level by day. Also it protects plants from pigeons and rabbits. 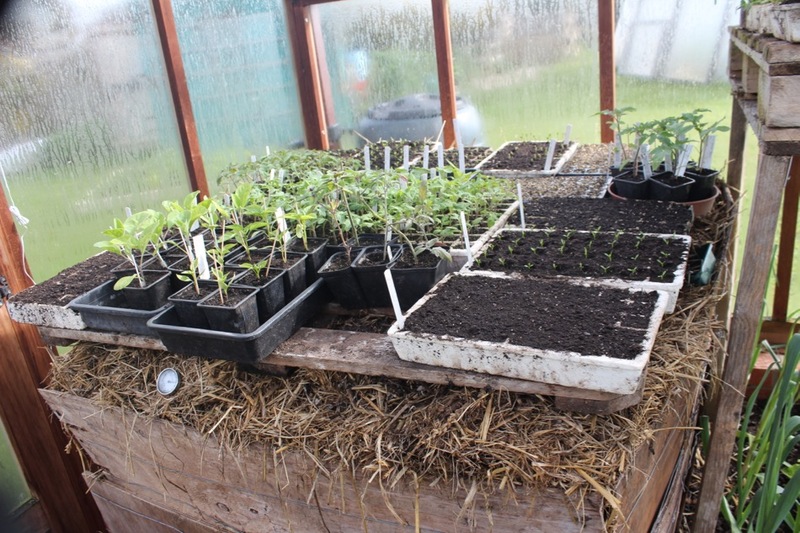 For example on April 8th we picked the first pea shoots from 12in/30cm high plants which I sowed 11th February and set outside after three weeks, then they have had fleece resting on them ever since. From my experience, this is an overstated task. All the plants you can see in the photo of the dig, no dig experiment were taken out of the greenhouse and planted straight into soil. This saves a lot of time and space, both inside and out. The fleece acts as a softener, protecting plants from cold winds, heavy rain and hail, as well as pests. Warmth accumulates at surface level in sunshine; deeper in the soil I have not measured much difference between soil under cover and open, at both 1.5 and 3in depth, when it was bright sunshine. 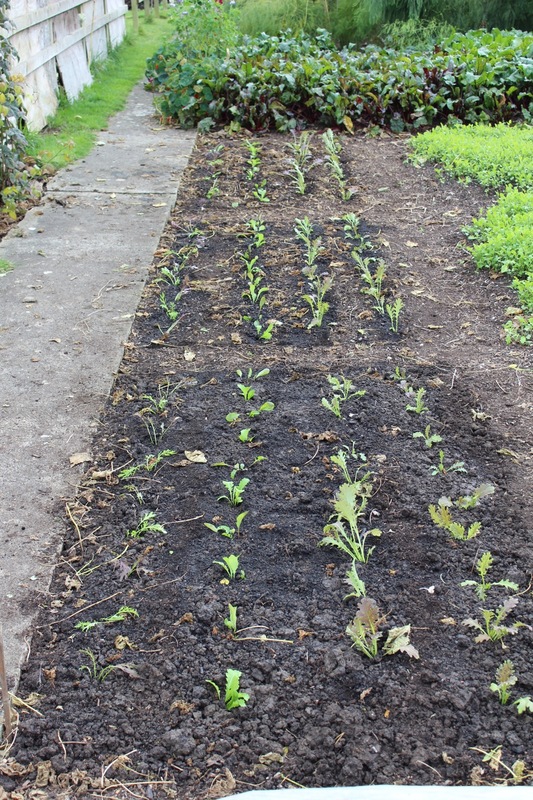 In mid October we planted some September sown mustards, after clearing runner and borlotti beans. There were Red and Green Fills, Red Dragon and also a few salad rocket. 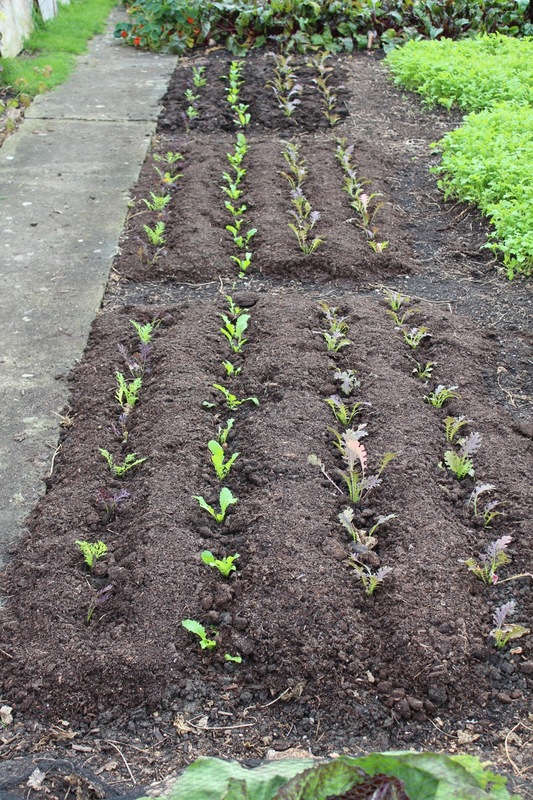 After planting I spread some compost between the rows (menat to have done it before, but October is a hectic month). 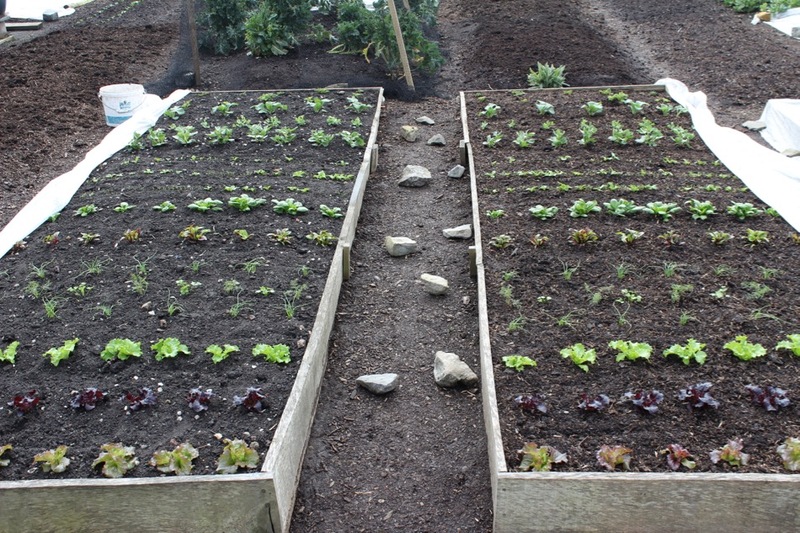 Six months later its interesting to see how the main survivors are Green in the Snow mustard and salad rocket. They are thriving! 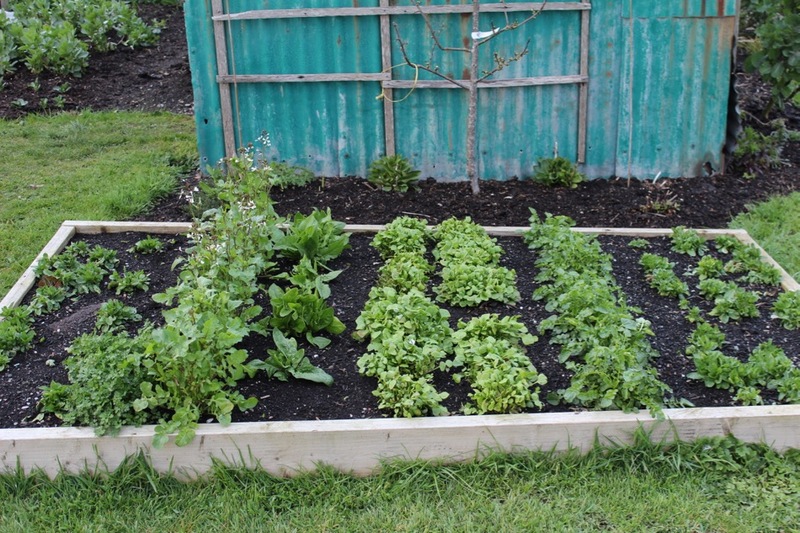 Also on a salad bed planted early October with lambs lettuce, spinach, salad rocket, chervil, winter purslane (Claytonia) and land cress, plants have survived really well, again with no protection. Harvests during midwinter are small, and extra precious. 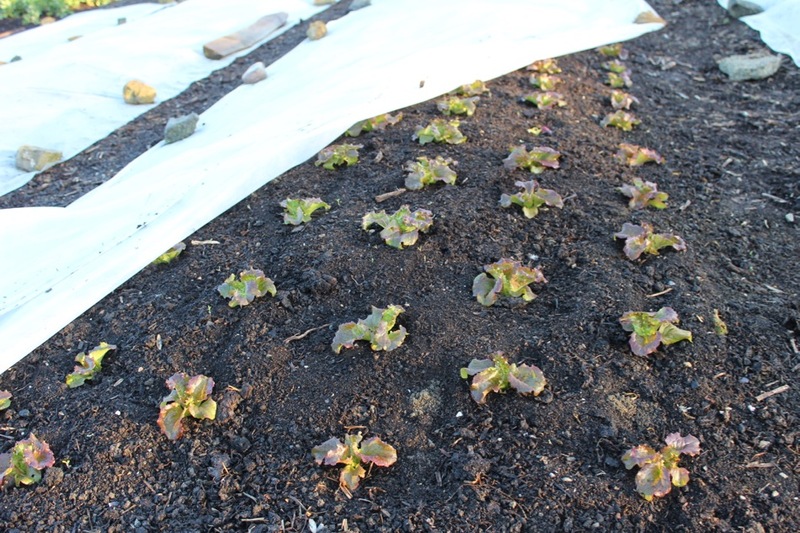 In the photos below, the Grenoble Red lettuce is much more bronzed in the polytunnel, compared to the greener Grenoble Red in the greenhouse. All plants are from the same sowing. Likewise there is more colour in the polytunnel’s red mustards. I think this is a combination of better light in the tunnel (no wooden frames) and cooler nights. 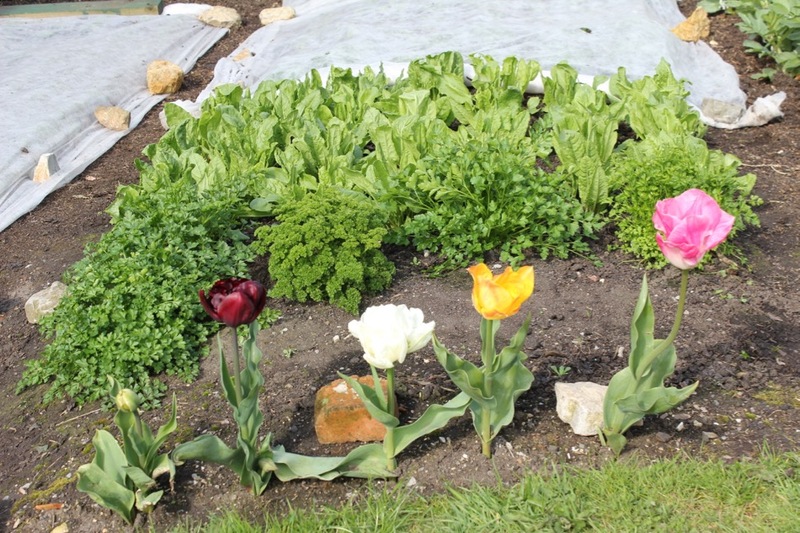 Cristina Crossingham at Bristol’s no dig Easton Community Garden – As part of the city’s annual Get Growing Trail we will be open to visitors on 4th and 5th June this year from 12pm till 4pm each day. It will offer explanatory tours of the garden with tea and cake. 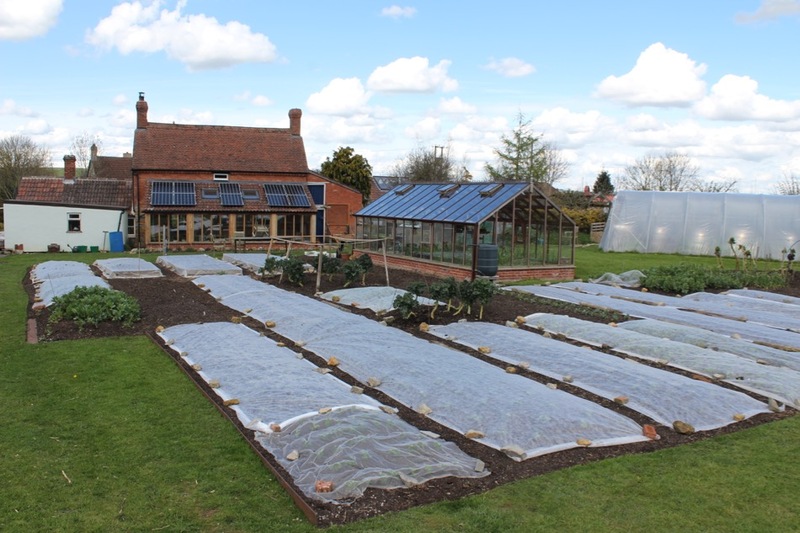 Featuring no-dig soil care, comfrey, compost and cultivation etc with ‘people care’ included. I find it exciting to be out and about for more talks, and to feel the interest in no dig. 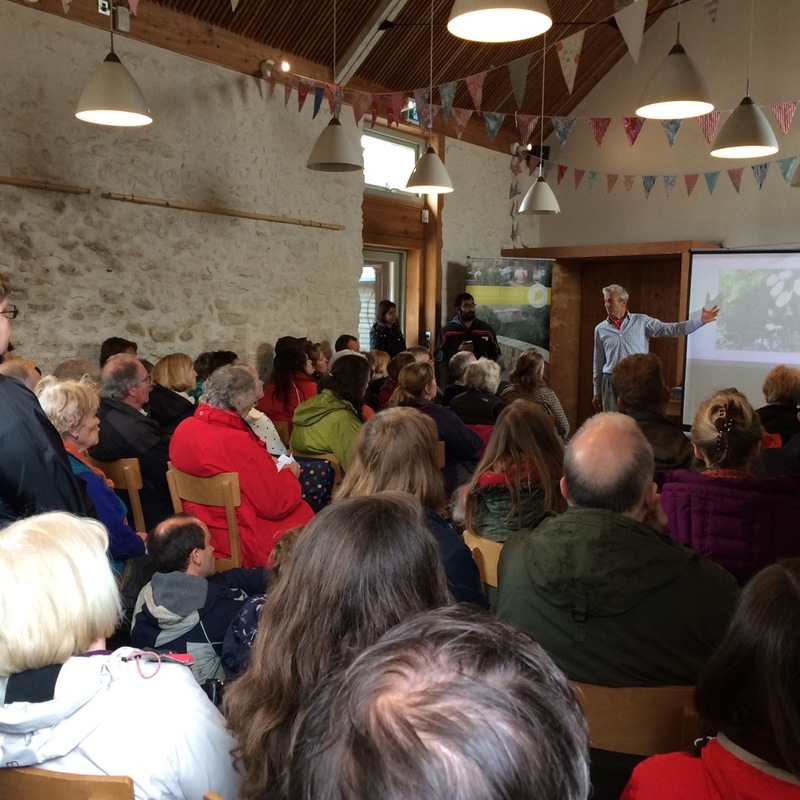 We had a fine time at River Cottage near Axminster where so many of the 400 ticket holders were crammed in to hear my morning talk on no dig. Steph’s talk was popular too, and here is her post about it on her blog nodighome. 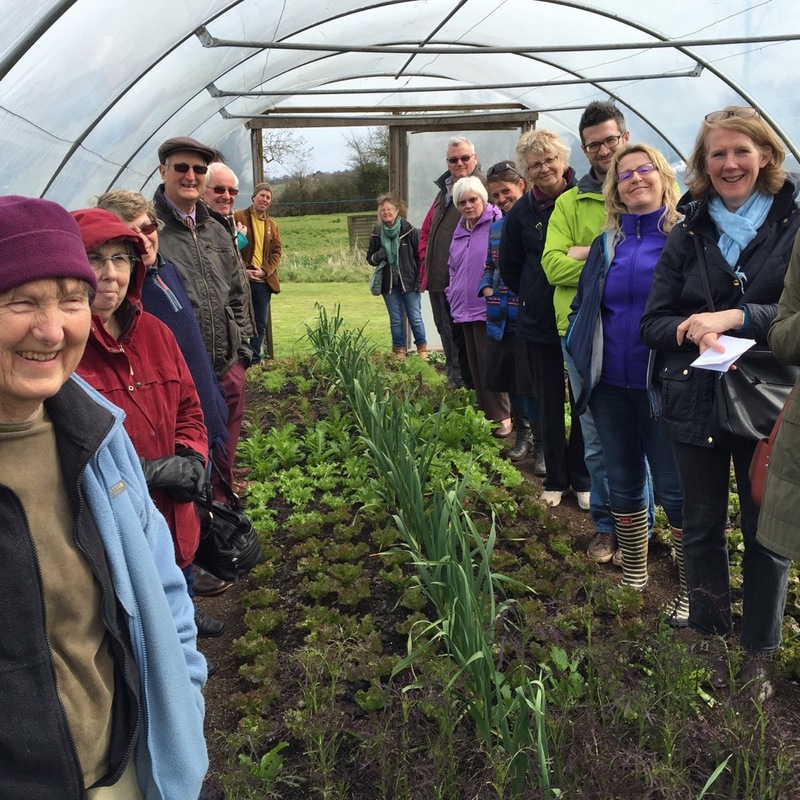 During the season here I show groups around the garden and this year’s first visit was Shepton Mallet Horticultural Society, with many other gardeners joining in. Despite the wind it was fun looking round. 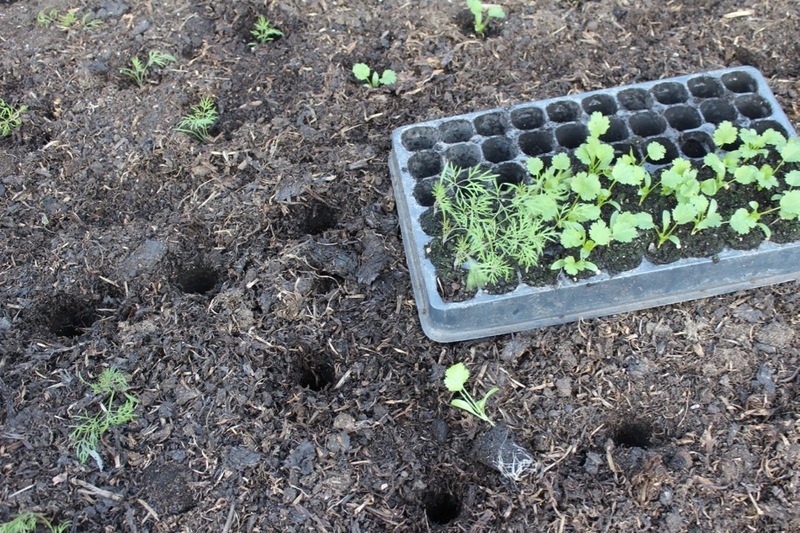 Just to report that sowing radish both as an interplant between rows of parsnip or transplanted out after sowing 4 seeds per module in 15 module trays are now producing beautiful roots after living most of their time outdoors under fleece. 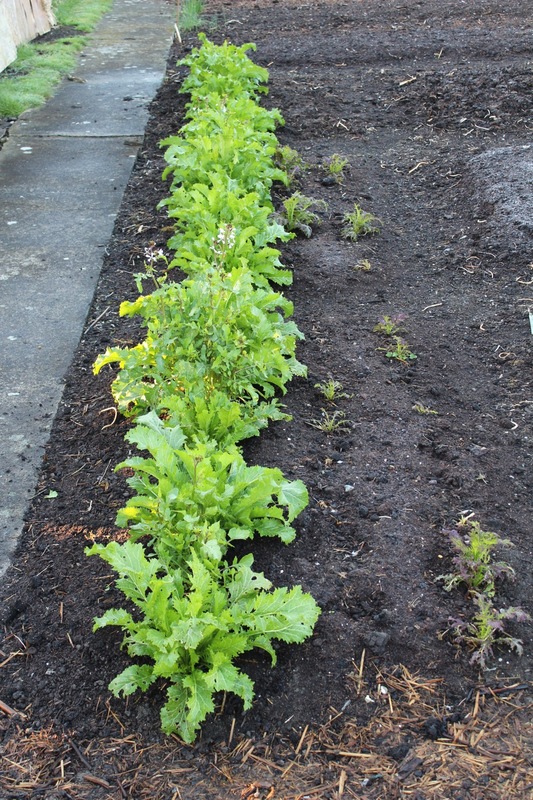 This is a big improvement for early radish over growing under the elements in late March (normally, such seeds germinate well but fail to thrive particularly). Thanks for introducing this season extension which has produced results so quickly. 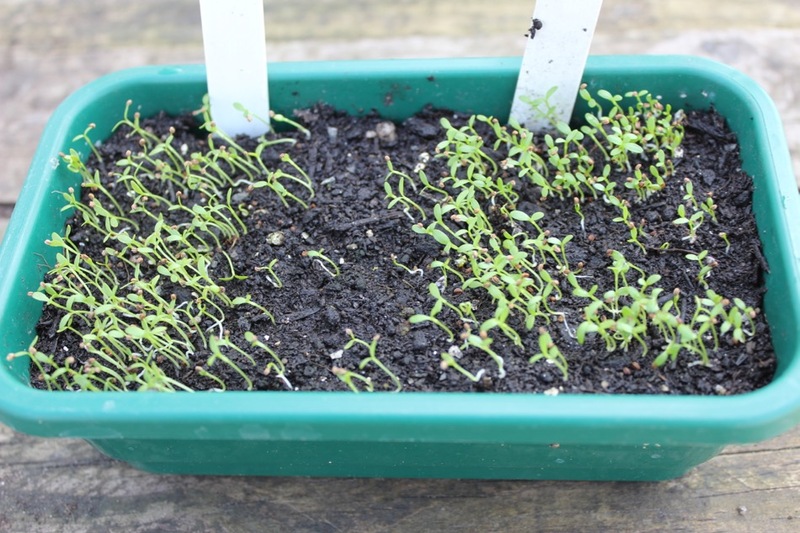 Normally, my high quality radish only start emerging in mid-May after mid-April sowings or later….. I popped some courgette seeds into the inside of my 1 cubic metre compost heap created end of March 2016 about 3 weeks ago and, lo and behold, seedlings are emerging. We shall see whether we can get a good crop of courgettes whilst rotting down compost! Another observation is that peas germinated in modules and transplanted at about 10 days do fantastically well under fleece. They are now 6 inches high and with plenty of leaf, whereas they barely had any leaves at all when transplanted out 10 days ago. Finally, as a ‘natural indicator of temperature/spring’, we have finally seen the odd asparagus spear breach the soil surface the past few days, but still nothing close to harvesting. 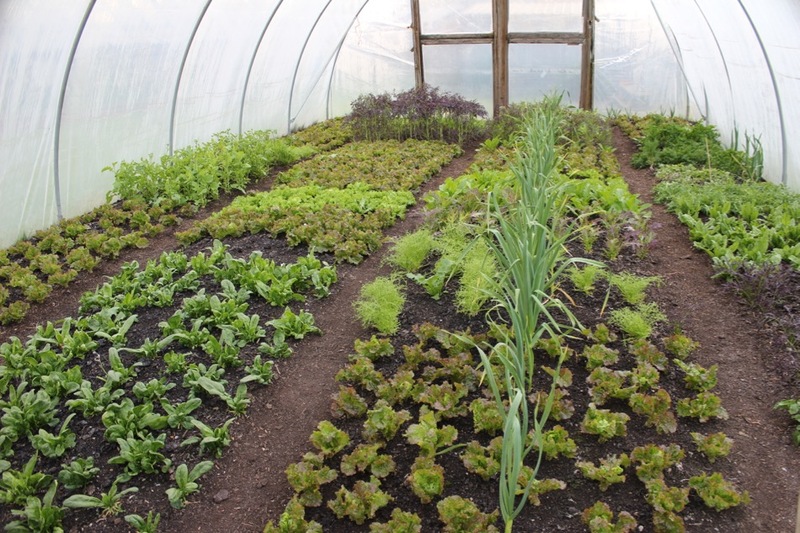 The chard is still not ready to harvest and the only things out under the elements we have managed to crop to date in April are Durham early cabbage and rhubarb. Thanks for your comments Rhys. There is going to be a lot of growth in May!! including asparagus. And yes, planting small works better than letting plants grow too big with any leaves yellowing at the base. Article: To dig or not to dig?